I’ve been busy, I’d like to say with work but really it’s mostly been Skyrim. I put off playing it for a long time because I knew from past experiences with Oblivion that once I started playing it, I wouldn’t really want to stop playing it and well I was right ^^; When not playing Skyrim, I have actually been very busy with work and the “let’s get the apartment more organized” initiative. 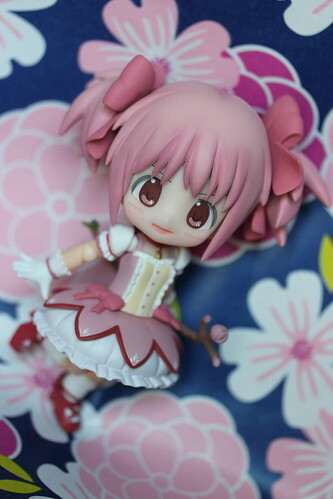 I absolutely adore Madoka so even though in general I have been very good at cutting back my anime figure buying, I find myself having a hard time resisting Madoka figures. This particular figure was absolutely adorable and it was from a new line I hadn’t really heard of before and it’s proportions are somewhat similar to nendoroid so that sounded like good enough justification for me to buy it to investigate! 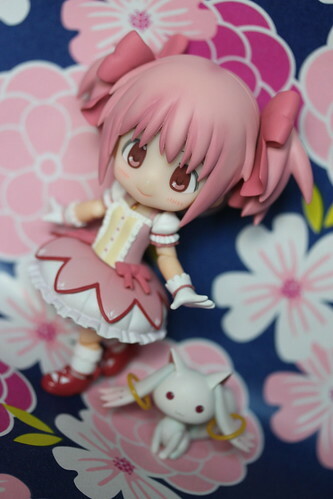 Madoka is from Kotobukiya’s new Cu-poche line, she was the second figure released in the line. Fellow Puella Magi Madoka Magica alum Tomoe Mami is slated to be released as the seventh figure in the line in November (I preordered her!). 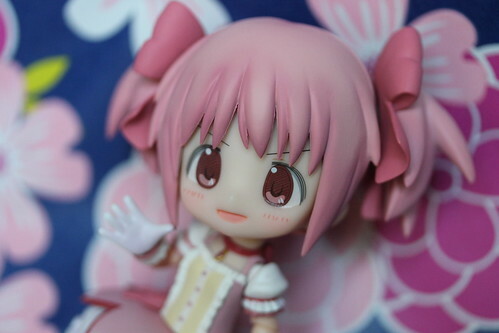 Madoka’s MSRP was 3800 yen which is a little pricier than the nendoroid who was 3333 yen. 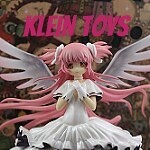 I absolutely love Madoka’s joyous expression, I think Kotobukiya really managed to capture her essence. 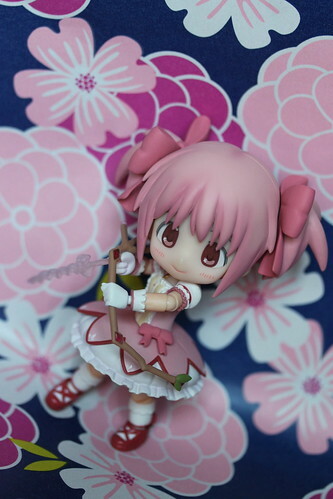 Madoka came with three changeable faceplates, her bow and arrow as well as Kyuubey. I particularly like the dismayed face. 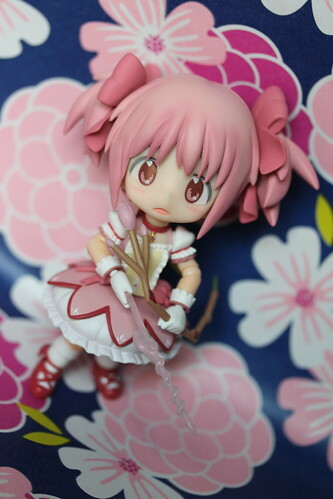 Even when she looks dismayed Madoka is adorable. With few exceptions (offhand I can think of the Super Movable Saber) cu-poche are more articulated than nendoroids, they have knee and elbow joints while most nendoroids do not. I love articulation as it means I can have more fun posing the figure, I have to say that she posed really well for me. My only slight issue was that sometimes especially when using the hand designed to hold the bow there seemed to be a little bit of a gap between the hand and the wrist- no matter how many times I pushed it back in, it seemed to prefer to stay out just a little ^^; . I’m quite happy with cu-poche but I also love the nendoroid, they are both cute so if you have to choose I recommend getting both. 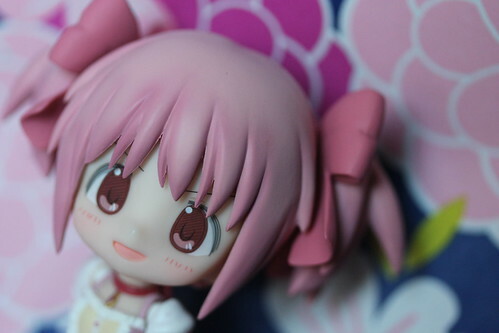 I hope to do a proper photo comparison of the cu-poche and the nendoroid of Madoka some time soon. This entry was posted in anime figure and tagged anime figure, cu-poche, kaname madoka, kotobukiya, madoka, Puella Magi Madoka Magica. Bookmark the permalink. I have this girl too, and I loooove her XD Although I have to admit I’m slowly exchanging my Nendo for the Cu Poche versions when they come out… not because I don’t love them both, but just because of space allowances, LOL!!!! I’m not sure if I’ll trade them out for nendos but I will definitely be keeping a close eye out for future releases (I already have Mami preordered).